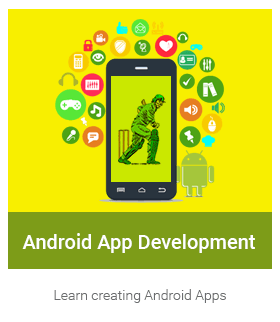 Our Mobile (Android) App Development course is designed to introduce you to the world of application building. The course offers scenario-based learning and hands on experience of developing a mobile application with 16 exciting levels of app development. We begin with the concept of Mobile applications and their features . A detailed explanation is given on the types of applications, their functionalities and comparison. Understanding the importance of cross platform compatibility and finally a detailed analysis is given on Andriod popularity and the prerequiste required to learn Android. We then dig into the first step of creating applications by understanding the importance of setting up an environment using Android studio. You will get a link to download Android studio. A brief explanation is given on the features and the advantages of using Android studio for creating apps. Finally, a procedure to update SDK tools is discussed. This chapter helps to understand the steps involved in creating an Android Project. Understanding the procedure to create a new project and how to add activity name, layout name and title name for the new activity that is created. We simplify this procedure and steps with the help of a pictorial representation. Then comes the important step of setting up user interface. Understand the concept of layout and layout attributes. We try our hands on a simple layout with the text field and button. A detailed explanation is given on how to add buttons and string resources. 5. How to run the Application? We then demonstrate how to run or execute android project using two methods. One is through Android studio and another using the command line. A detailed explanation is given on running an app on a real device or in an Android emulator using these two methods. We create our first mobile application - a simple calculator. The code is divided into three parts to understand the flow and usage of methods. The first part explains on creating button and text objects and declaring the data types.The second part defines the button and text objects. Here we also learn various methods such onClick(), setOnClickListener(View.OnClickListener),onCreate(),setText(),getText().The third part explains the source code for creating the user interface(layout) for the calculator. Here, we understand the flowchart of the activity lifecycle. Explanation is given on how to launch an activity and the methods used to start an activity. Understanding the concept of creating an instance and the importance of destroying an activity. Introduction on INTENT and Intent-filters are also shared. This helps you understand the behaviour of the app when it is paused. We also explain the usage of onPause() method and when it has to be initiated. Basic idea on Camera class is also given. Explanation is given on the importance of revoking the onResume() method after the pause mode. This helps you understand the behaviour of the app when it is Stopped. We also explain you the importance of onStop() method and when it has to be initiated. Explanation on resuming and restarting an activity is also shared. We then understand why Android OS should support features like supporting different languagues(spoken). Explanation is also given on how to support different devices, which may have different screen size. Screen compatibility features are also discussed. A brief explanation is also given on how OS supports different Android versions.The above three categories are explained through example Source code. We then focus on how an application can be interactive and compatible with other applications with implicit and explicit intent. Here, we learn how an an app interacts with other apps when a request is initiated from an activity. Concept of intents and types of intent are briefly explained. A detailed explanation of building an implicit intent is given. Methods used to verify the intent before it is invoked is also discussed. A detailed study on how to start an activity and to handle intent is also shared. This chapter explains about explicit Intent. A detailed study on how to get result from an activity that was invoked is discussed. The methods and attributes are also discussed in the process.A brief explanation on the how the app has to respond when invoked or initiated by other apps is also shared. A brief introduction on menus is given here. Methods to define menu is explained in detail. Explanation is also given for creating option menus, contextual menus, popup menus and menu groups are also shared. A brief idea on how to add menu items based on an intent is also explained. This chapter explains on how to set up an app bar. It also explains on how to add action button and how the button should respond when its invoked. A detailed explanation on adding an up action is also discussed. A brief study on Action View and Action provider is also given. Then comes another important lesson in building apps with internal and external data storage capabilities, using SQL. A brief study on how to save key-values using ''Sharedpreferences" is given. Explanation on saving files on internal or external storage is also shared. A detailed study on how data is saved in SQL Database is also discussed. Our course ends with interaction amongst various apps and building apps with cloud connectivity, location and maps. This chapter explains on how to build apps with multimedia, content sharing, animation, location, maps, connectivity and the cloud. A detailed study on each of these categories is given. And while learning all the concepts we also build applications like calculator and a cricket application that provides information on cricketer’s scoring statistics, likes, dislikes etc. We offer step by step learning using animated and whiteboard videos, multiple choice questions, interview questions, exercises and some interesting facts about Android.